I had always planned to offset my web hosting costs by running AdSense ads in the background of this site. I imagined that a couple of discreetly placed ads would not get in the way of the information that my blog was seeking to deliver. Why do I regret enabling AdSense auto ads? Why do I think that manual ad placement is better that auto ads? Read on. At first glance, enabling AdSense auto ads seemed like a good idea. Manually placed ads take time to refine. Each ad unit needs to be defined. Will the ad be a ‘text and display ad’, ‘in-feed ad’ or ‘in-article ad’? Will it be responsive or hard-set? Will it be a horizontal banner, vertical banner, rectangular or custom? What will the ad style look like? Once defined, a website owner needs to find space for the ad, and manually (or with the help of a 3rd party AdSense tool) place the ads in their relevant locations. AdSense auto ads attempts to “do away” with a large portion of ad administration on a web asset. A simple code snippet pasted into the <head> tags of your site automates the type and placement of the ads. An administrator only retains control of the type of ‘in-page ads’ and ‘overlay ads’ that are shown, with simple on/off sliders. Machine learning takes care of the rest. So what went wrong for my site? In a nutshell: Too many auto ads combined with an extremely poor placement of auto ads. I normally post 1 ad under the post category menu, and 1 ad at the very bottom of every post. That’s it. However, auto ads decided to (and it would vary greatly between posts/pages) place between 2 and 7 ads per posted article. The multiple ads per post broke the flow of each article. My Google analytics showed a marked decline in blog readership since enabling AdSense auto ads. I wasn’t surprised. I felt that there was a large imbalance of ads to content. In addition, browsing my own site to check plugin updates and browser compatibility showed ads in ridiculous places. As per the featured image of this blog post, my site visitors were greeted with a large blank space on every single site page. The auto ads algorithm determined that a tower (tall and thin) ad was appropriate between my logo and menu. Crazy. The ‘automated’ placement of ads was detrimental to my blog. 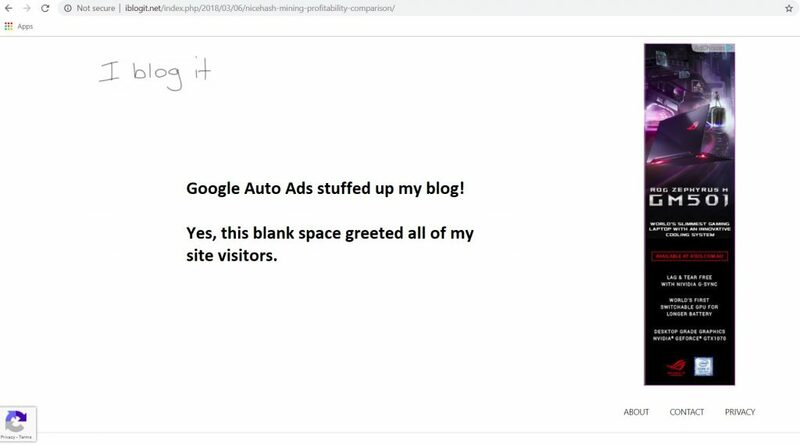 Visitor numbers dropped, and the AI driven algorithms of the auto ads feature never auto-tuned to a satisfactory level. I would steer any blog owner against using this capability. My experiment with auto ads lasted about 2 months, and I have since returned to manually coded ads. Visitor numbers, session times, and user re-visit and retention numbers have all improved.